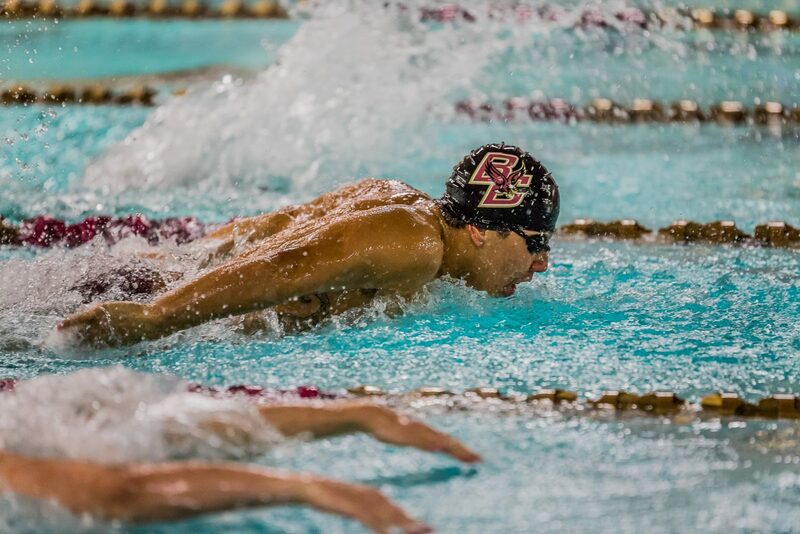 Estephen Saliba is a retired member of the Boston College Swim Team who will graduate in May with degrees in Finance and Information Systems. Estephen was elected as one of the three captains of the team during the 2015-2016 season. The value of his leadership was evident in the team’s impressive record of 12-1-1. Estephen was also a leader outside of the pool, where he volunteered in the Boston College PenPal program, and worked as the event planner for the Student Athlete Advisory Committee. Even while battling shoulder injury, Estephen concluded his season with lifetime bests in the 100-yard butterfly and the 50-yard freestyle. His time of 49.63 in the 100-yard butterfly makes him the third fastest 100 butterfly swimmer in the history of BC Swimming. As a sophomore, Estephen earned career best times in three events, and recorded four first place finishes. Estephen’s 100-yard butterfly race was recognized as the outstanding performance of the meet against Keene State. As a freshman, Estephen was selected to the travel squad for every away meet. He recorded career bests in four events, and earned three first place finishes throughout the season.